Archaeologists have unearthed twelve ancient sphinx statues at Luxor, Egypt. The sculptures were found at a newly discovered part of the Avenue of Sphinxes, an ancient road stretching from the temple at Karnak to the temple of the goddess Mut at Luxor. 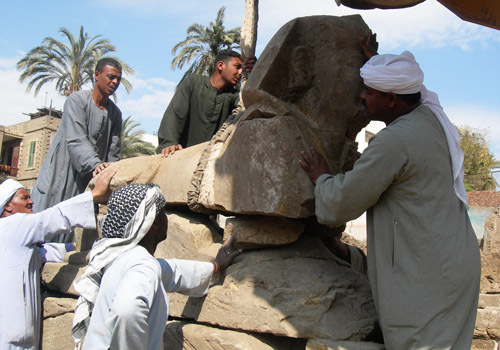 The discovery, made as part of excavation and restoration works at the site by the Supreme Council of Antiquities (SCA), was announced by Egypt’s Minister of Culture, Farouk Hosni. The statues of the mythical creatures, inscribed with the name of Pharaoh Nectanebo I, were found in the last sector of the Avenue of Sphinxes, a part of the sacred pathway that – although its existence was known to historians from ancient texts – was never precisely located. Mansour Boraik, Supervisor of Luxor Antiquities, indicated this is the first time a new road that runs from east to west – towards the Nile – has been found. The total length of the road to the Nile is estimated to be about 600 metres, with 20 metres excavated so far. These 20 metres were built from sandstone, brought in from the quarries at Gebel Silsila, north of Aswan. 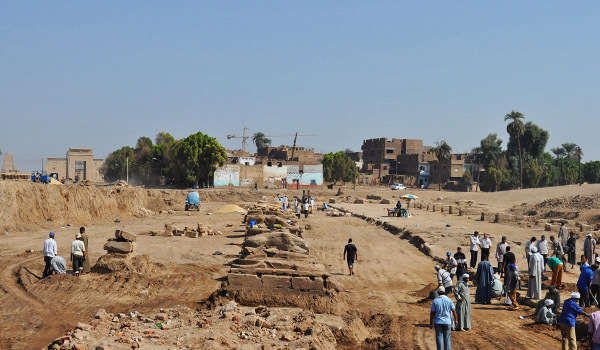 “The discovery is not located within the known road of the Avenue of the Sphinxes between Karnak and Luxor Temples, but instead at the end of the newly discovered road of Nectanebo I,” explained Dr Zahi Hawass, Secretary General of the SCA. Dr. Hawass added that along this way the sacred boat of Amun, king of the gods, traveled on the god’s annual trip to visit his wife, Mut, at Luxor temple. The Avenue of Sphinxes is about 2,700 meters long and 76 meters wide. Although the path was already in use during the reign of Queen Hatshepsut, it was the 30th Dynasty Pharaoh Nectenabo I (380 to 362 BC) who constructed the avenue itself. He lined it with 1350 sphinxes, all inscribed with his name. The sacred road was the location of important religious ceremonies, most notably the Beautiful Feast of Opet. This festival was celebrated annually in Thebes, during the New Kingdom period and later. Hidden from sight in a sacred barque, the statues of the gods of the Theban Triad – Amun, Khonsu and Mut – were escorted down the Avenue of Sphinxes, from the temple of Amun in Karnak to the temple of Luxor, in order to relive their marriage.